Do the Wind Requiem and point the wind to northeast. 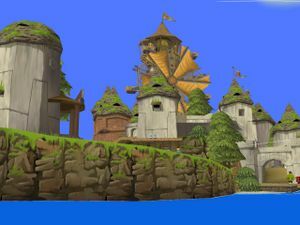 Sail to Windfall Island to where the pirates are right now. Remember the bomb seller with its outrageous price? Go around and go into a small tunnel which you crawl in (put away your sword or any items and hold until you get into the tunnel). A dialogue cutscene reveals that Tetra's ready to go to Outset Island the rest of the pirates wants to stay for the day. But after seeing Link, because Quill told the crew what happen to him, Tetra finally goes along with it. A simple footnote is after this sequence, next time you see the bomb seller, you'll get the best prices because of that moment. You need the password to go on the ship. So remember the password the crew uses and go to the pirates ship with that in mind. Fortunately, you don't have to worry bout using large or small caps. Lastly it's an eight letter password that changes by how many times you play this game! Niko will test you in this last challenge. There's no platforms and if you're out of time, the gate closes so you step on the switch to start again. This time you swing from rope to rope. Remember as you swing from one rope to the next is to also line up your swing as it moves back and forth slowly. About two swing works and if you do it right you'll be able to get the bombs. Like grapple hooks becoming a crane on the King of Red Lions to pick up treasure, bombs become bomb cannons which is needed to take down the stone slab on Outset Island. This page was last edited on 23 December 2010, at 09:16.